On May 1, Labor Day, Park Geun-Hye, daughter of deceased ex-President Park Chung-Hee who ruled South Korea for decades with military dictatorship made absurd remarks that, “In case of Hawai’i, tourism income is 24% while military-related income is 20% in its whole finance,” and “If we construct the Jeju naval base as civilian-military dual use port and make it well so that 150,000 ton cruise can enter and exit, it would not likely to be less than Hawai’i” (Headline Jeju, May 1). On March 30 before General election, Park, supporting the candidates of the Saenuri Party (the ruling conservative Party)-though none were elected in the Jeju Island furious on naval base, has said, “We should make Jeju like Hawai’I famous for global tourism site and naval base.” It was a happening that reminded absurd remark by Kim Tae-Yong, ex-Minister of National Defense on March 20, 2010. Amidst raining all day, Gangjeong villagers and activists protested against her spreading absurd remarks of so called civilian-military dual use port, from morning to afternoon. The Military Impacts in Hawai'i should be a Warning to Koreans about the threat to Jeju island. Ms. Park Keun-Hye is gravely mistaken to claim that military bases have been good for Hawai'i and therefore would be good for Jeju. The U.S. invaded and occupied the sovereign country of Hawai'i in order to build a military outpost. This included the taking of more than 200,000 acres of land for military bases, training and other activities. The result has been the destruction of the environment with more than 900 military contamination sites identified by the Department of Defense. The military's toxic cocktail includes PCB, perchloroethylene, jet fuel and diesel, mercury, lead, radioactive Cobalt 60, unexploded ordance, perchlorate, and depleted uranium. When the U.S. took over, especially during WWII, the military seized thousands of acres of Hawaiian land. Whole communities were evicted, their homes, churches and buildings razed or bombed for target practice, their sacred sites destroyed by bombs or imprisoned behind barbed wire. Recently, hundreds of landless Native Hawaiian families were evicted from a secluded area of O'ahu where they had been living in cars and makeshift tents. They are the internally displaced native people, evidence of the so-called 'benefits' of militarization. 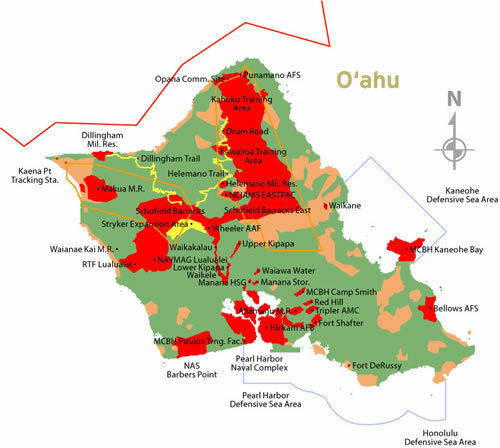 Meanwhile the military occupies more than 13,000 acres of Hawaiian land, comprising a third of the land in that part of the island. The enormous military presence did not bring security. On the contrary, it made Hawai'i the prime target during WWII and the Cold War. Militarization imported the most virulent forms of racism and martial law to the islands and provided the U.S. a launching pad from which to expand its empire. The military interests of the U.S. continue to override the needs and security of local communities as it distorts our development in ways that serve empire. I would invite Ms. Park to take a swim in Hawai'i's most famous military-tourist attraction: Pearl Harbor (the true name given by Native Hawaiians is Ke Awalau o Pu'uloa). However, the water is too toxic. And before she could get very far, she would be arrested by the Navy for trespassing in military waters. There is no tourist activity within Pearl Harbor except for those museum sites controlled by the government. Ke Awalau o Pu'uloa is a perfect example of the dangers of militarization. The U.S. invaded and occupied the Kingdom of Hawai'i in order to take Ke Awalau o Pu'uloa as a strategic port. What was once one of the most productive fisheries for Native Hawaiian people with extensive wetland agriculture and aquaculture complexes that fed many thousands on O'ahu island has become a giant toxic Superfund site. Today there are approximately 749 contaminated sites that the Navy has identified within the Pearl Harbor Naval Complex. The seafood from Ke Awalau o Pu'uloa is no longer safe to eat. The famous pearl oysters are no more. It is partially true that the military has become a major economic source in Hawai'i, but at a very high price. The military economy is artificial. It is largely a result of the corrupt processes of the military-industrial-political complex that injects money for pet projects in the islands like a drug. Politicians, businesses, and even unions become addicted to the quick high of these federal infusions and then become desperate to chase the next fix, even at the expense of the environment, Hawaiian rights and sovereignty and peace in the Asia-Pacific region. Meanwhile the real source of Hawai'i's economy - the beauty and health of our natural environment and our cultural richness - deteriorates at an alarming rate. The questions that we must always ask about the alleged economic benefits of the military in Hawai'i are: "Who gets paid? Who pays the price? What are the real social, cultural and environmental costs of such a dependent economy?" The native people of the land are the ones whose lands are always stolen and destroyed by the military. They and other poor groups live in the toxic shadow of the bases. Other productive capacities wither away as Hawai'i has grown completely dependent on imports (90% of food is imported) and federal spending. Meanwhile those who benefit most from the military economy are the contractors (many who flock to Hawai'i when new military funds are approved) who feed on the destruction wrought by all this so-called 'prosperity'. Jeju island is a unique cultural and natural treasure that must be protected from military expansion. The beautiful islands of the Pacific are being targeted because the governments think we are small and insignificant. But islands do not have to be isolated. As the peoples of the Pacific have known for centuries, Ka Moananuiakea (the great ocean) unites us, brings us life, culture, food and solidarity. We must join our efforts and broaden our solidarity beyond our local shores, we can weave a net that is big and strong enough to restrain those monstrous fish that threaten to devour us all.